We are a community of nearly 2,500 people in the southern Minnesota region between Mankato and Minneapolis. As the county seat of Le Sueur County, we are a vital link to our neighboring communities as a retail, manufacturing and cultural center which makes us a community that is truly making a positive difference in the lives of people and the communities around us. 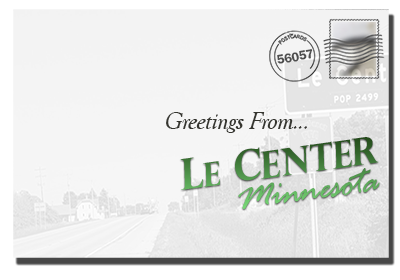 Le Center, Minnesota....The Heart of Le Sueur County! ⚑Federal Holiday - Offices Closed. Results are in for the November 6th election. Summer is here and the Pool is Open! Swimming Lesson registrations will be held at City Hall from 4pm until 8pm on June 1st. Thank you for visiting our website! We hope it entices you to visit our wonderful community. With a population of about 2,500 people, Le Center is known as "the heart" of Le Sueur County, as the county seat where the Courthouse and Sheriff's Department calls home. While we're a great place to work and visit, were an exceptional city to live and play in as well.